Lake Tenkiller is one of Oklahoma’s most precious gems. Not only is it visually appealing, but it’s also home to a number of activities, adventures and ways to really connect with nature and Tenkiller’s unique flair. Here are eight adventures, from the extreme to the tranquil, that you shouldn’t pass up while visiting. You go to the lake for a reason, right? The water! It’s simple – but sometimes the best adventures are the most obvious! Lake Tenkiller’s emerald waters, and wooded landscape make for an incredible paddling experience. The lake almost invites you to jump in and enjoy. Along the lake you’ll find dozens of opportunities to rent paddleboards, kayaks canoes and more! It’s the perfect way to get acquainted with one of Oklahoma’s most appealing features. Due to the lake’s clear waters and great location, Tenkiller has made itself host to a wide array of SCUBA enthusiasts from across the world. This popularity eventually led to Lake Tenkiller’s very own underwater dive park. The park includes a wide array of unique pieces, including a plane fuselage, bus and even a sunken helicopter! If you’re looking for more of a tranquil adventure, then you’ll definitely want to get to the nature trails. Lake Tenkiller is renowned for it’s winter-season bird watching, in which bald eagles generally make themselves known. Year round, you’ll also find a wide array of beautiful birds, including hawks, warblers, woodpeckers and much more. Aside from birds, the trails are great for viewing many forms of wildlife, and it allows you to kick back and enjoy the fresh outdoor air. 3.America’s Real Favorite Pastime: Fishing! When it comes to fishing – Oklahoma can’t be beat! This has been common knowledge of professional fly fishermen, and just buddies with boats. The same can be said ten fold for Lake Tenkiller, because not only is the lake beautiful to look at, it also happens to be packed with bass, crappie, catfish and more. So grab a buddy, pack your rod and reel, and get hooked on fishing the lake! Also, check out the local marinas to purchase fishing licenses, permits, poles, lures and bait. Not only does Lake Tenkiller supply the water and fish, but all the necessary add-ons, accessories and more to ensure the perfect experience. 2.Unwind with a Round of Golf. The Wolf at Tenkiller is an expertly maintained 18-hole golf course settled on the beautiful Oklahoma landscape near the lake. The course opened in 2012 and features Tifeagle Bermuda greens and an incredibly serene setting. On site, enjoy the pro golf shop, and regular lessons to help improve your game. This is the perfect day to relax after a day on the lake or on the trails. So, grab a few friends, and get to it. Stay at one of Lake Tenkiller’s many Bed & Breakfast’s. With charm, delicious food, and distinct Oklahoma hospitality, a bed and breakfast will be the perfect setting to tie in with the beautiful lake. You can also relax knowing that you’re in the care of locals who have native knowledge of the lake, and all its perks! 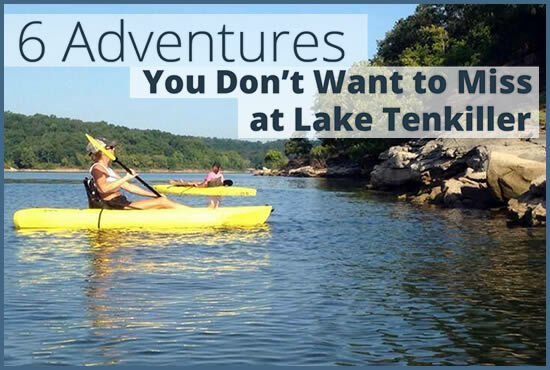 These are just a few ways to enjoy the lake, Tenkiller is renowned for it’s many adventures and activities. Can’t fit it all into one weekend? No problem, just come back for more! Tenkiller would love to have you! This entry was posted in Lake Tenkiller, Oklahoma Bed & Breakfast by Mark Marcelletti. Bookmark the permalink.